Valve may have an aversion to making games with the number 3 in them, but that doesn't mean franchises like Portal are dead. This week, Valve and ClockStone Software announced a partnership to develop a new Portal game... as a tie-in with ClockStone's Bridge Constructor series. Bridge Constructor: Portal is pretty much exactly what you'd think: a game where you try to send a vehicle (or multiple vehicles) across a gap in the road, either with an expertly-built bridge or the use of portal technology. 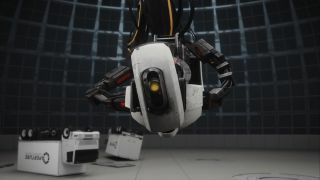 It doesn't look like a canon expansion of Portal lore, but it still retains fan-favorite hallmarks like talking turrets and GLaDOS mocking your every failure, so it should feel authentic despite the extreme changeup in genre. Meanwhile, those hoping for a full-fledged sequel to Portal 2 will have to keep waiting. Maybe they can pass the time with the Dota card game that Valve announced earlier this year? Think of it as building your own metaphorical bridges after the negative reaction Valve received for that announcement. What's that? You want to know about that other Valve series that has done everything it can to avoid the number 3? Well, sadly, it's probably not going to come back or finish telling its tale. I suggest consoling yourself by reading some "fan fiction" from the lead writer of Half-Life if you need some closure on that front. As for Bridge Constructor: Portal, the game will come to PC, iOS, and Android devices on December 20 before making its way to PS4, Xbox One, and Nintendo Switch in early 2018.